Pyramid Hill is situated on the northern plains of Victoria. 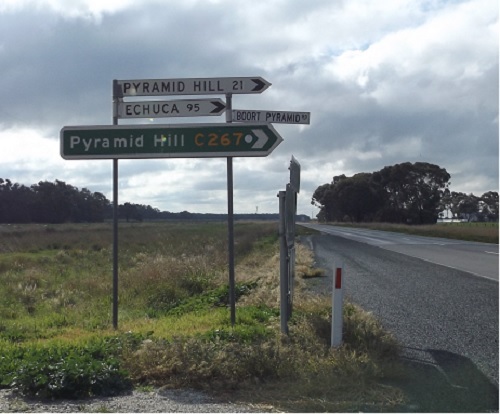 On the north eastern boundary of the Shire of Loddon, Pyramid Hill township lies between the Loddon River and the Bullock Creek – 60kms west of Echuca and 100kms north of Bendigo. (see online Whereis map) There is an interesting low range of hills to the east of the town with Mount Hope to the north east, also climbed by Major Mitchell. The name derives from Mitchell’s hope that he might see the ocean from its peak. Burke and Wills also camped there. Mount Hope is a natural reserve covered with wildflowers in the spring, with good views of the district and Kow Swamp from the top. Kow Swamp is a wildlife sanctuary with fishing, camping, and abundant birdlife and is an important aboriginal archaeological site. At the southern end of the range is a native Murray Pine forest of 2833ha known as Terrick Terrick National Park. The park has numerous granite outcrops – the southernmost, Mitiamo Rock, has an adjacent picnic ground, and walks through the forest reserve will reveal a variety of birdlife and other fauna including kangaroos. Terrick Terrick protects an important remnant of northern plains flora including the state’s finest stand of native white cypress pines. Pyramid Hill is serviced daily by the Vline train as well as buses. Cohuna, with its many attractions, is nearby and the Murray River tourist town of Echuca is within an hours drive.